As we near March 2019 and the end of the two-year transition period, Brexit is at the forefront of our minds, particularly in the legal and business sectors. To learn more about the possible implications of Brexit and what the future holds for the legal industry, The Attic caught up with Eduardo Reyes, commissioning and features editor of the Law Society Gazette. The Law Society recently warned of £3bn loss from the legal sector after Brexit. Can you explain the challenges ahead? Trade in services post-Brexit has not been prioritised in government policy, so the test for our legal sector’s commercial resilience will be unnecessarily tough. Uncertainty and barriers to trade have a chilling effect on the transactions that also ultimately feed disputes. Law here has an incredible infrastructure – a concentration of skills that won’t change overnight. But doing business here post-Brexit will involve inconvenience on many, many fronts – obstacles that we don’t currently have. The big unknown is what international clients’ tolerance level is for that. There was research done by Thomson Reuters that showed corporate clients are questioning whether they should use England and Wales law in contracts – a worrying sign that we can’t take loyalty to this jurisdiction for granted. How will Brexit impact the UK’s position as an international centre for legal expertise? Let’s take the example of a well-established competition law specialist or commercial litigator – a partner in a law firm or a QC. They have a client following, a great reputation, are likely to have qualified in Ireland since the referendum – possibly acquiring an Irish passport too if they meet the citizenship criteria. It’s a hassle, and they probably voted ‘remain’, but they find a way to carry on – April 2019 for them may not be terribly different to February 2019. The impact is on the next generation of lawyers, who won’t have easy access to the experiences that lawyers now at the top of the profession did – going to the European University Institute, working for the European Commission, appearing before the European courts. We are decoupling from all that – so it becomes harder to become as good as you could be. A thought also on the courts. The quality of the Commercial Court is a reason to do business here and to choose London for resolving disputes. The fact that there are vacancies on the bench, and that recruitment is a challenge, is profoundly unhelpful as we set about trying to convince businesses to continue doing deals and litigating here. Will leaving the single market influence the demand for legal services, and will Brexit create new areas of work for lawyers? There will be work for trade, regulatory and immigration lawyers linked to Brexit. But the powerhouse of any City or international firm is its corporate department – that’s what sustains the world-class parts of our legal economy. Ancillary areas can’t fill a substantial shortfall in corporate work. How could law firms and in-house legal teams address the potential loss of talent in a post-Brexit Britain? A huge amount depends on the immigration and work rules that are put in place. We have had a taste of how this will likely play out, with the ‘quota’ for non-EU employees – the monthly cap is regularly met before month-end, leaving businesses and the public sector – including the NHS – short of the people they need. Those that can plan ahead and support the people they want to hire from abroad with help and advice will be at an advantage compared to others. But, as the government read the referendum result as an anti-immigration vote, there is no likely outcome that does not make life harder for employers. How will Brexit influence overseas law firms, particularly those with a strong presence in the UK? Many overseas firms fill their UK offices predominantly with England and Wales-qualified lawyers, so this isn’t going to be like when the elves all suddenly leave Middle-earth in The Lord of the Rings. Long-term, their response is heavily dependent on how deal-doers respond to Brexit. Is the concentration of professional expertise and the depth of London’s markets enough of a reason to tolerate the inconvenience of doing deals and fighting litigation in a “third country”? Watch for what happens when European managing partners change at international firms – are they drawn from the London office or from Brussels, Frankfurt, Paris. That could be one sign that their interest is shifting from London. Beyond Brexit, what changes and developments in the legal industry do you expect to see in the next few years? Technology is in the process of transforming the legal sector, and for some firms is their biggest expenditure after people. Technology is changing what lawyers do and, in the case of junior lawyers, what they can get paid for doing. I don’t, though, buy the idea that robots ‘replace’ lawyers. Technology, regulation and legislation are together making the world more complex, not less – boosting the demand for lawyers. What lawyers in the future can expect is different tasks on their way to the top, and much closer collaboration with technologists. ‘Robots’ don’t just take tasks from people, they also give people things to do. Eduardo has also written for the New Statesman’s The Staggers pages, the BBC’s Ouch blog, the Reformer and Lib Dem Voice. He was head of research at Spada PR, editor of In-House Lawyer Magazine, and legal affairs researcher for the Liberal Democrats. 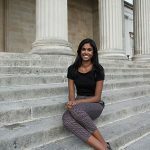 Sanjana is a final year Modern Languages student at UCL and an aspiring city lawyer. She is currently doing an eight week business internship at Obelisk.